“Most of the primitive bridges over the numerous creeks and marshes had rotted away, and we had some difficulty in crossing on fallen trees or a few thin sticks. This was the case all the way to Banalya, and I may here state that this condition of the roads, even of the most frequented, is universal in this province. The reason is that the local authorities have neither men, means, nor time at their disposal for the making of decent roads. The parsimony of the State in this respect is the more remarkable in the ‘Domaine Privé,’ whence large amounts are derived, and where next to nothing is expended. “So long as the policy of the State Government is to extract all it can from the country, while using only local materials, and spending the least possible amount on development and improvements, no increase in the general well-being can be expected…. 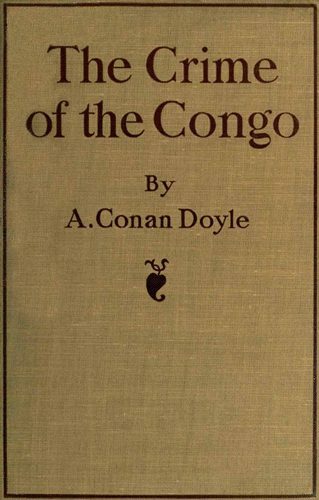 “… At all the posts on the north (right) bank, between Yambuya and Basoko, I found the European agents absent in the interior, and at Basoko itself only the doctor was left in charge, all the rest of the staff being away ‘en expédition,’ that is, on punitive expeditions. “I stayed at Basoko for five days, partly at Dr. Grossule’s request, and partly in the endeavour to learn something of the operations going on in the interior. Three canoe-loads of prisoners arrived, all heavily loaded with chains. But all I could learn was that they were sent in by Lieutenant Baron von Otter, who had been sent to the promontory lying between the mouth of the Aruwimi and the Congo to enforce the Labour Ordinances. “In all the Basenji villages through which I have passed on my two journeys, the natives assert that it takes them three weeks every month to find and make their tale of rubber, besides taking it once every three months to the State post, from four to six days distant. “This country is taxed to the utmost, not one penny of the proceeds of which is spent on the roads. This condition of the most important highway in the province is nothing less than disgraceful, and yet this is the road of which the authorities are really proud. “Thus, with the exception of a trivial payment for some things, the Government carries on the work of the country at no expense beyond the wages and the European rations of the white agents, and these are excessively few in number. It is true there are the Force Publique and some travailleurs. These are recruited by conscription and receive pay and rations, but it is at the lowest possible rate…. “Coming to the Basenji, the following particulars of a village in the forest will show their liabilities. This village has fourteen adult males; its neighbour, which works with it, the chiefs being brothers, has nine. Each man has to take to the State post a large basket, holding about twenty-five pounds of rubber, once every month and a half. To get this rubber, though they find it only one day’s journey distant, takes them thirty days. It then takes them five days to carry it to the State post, and three days to return. Thus they spend thirty-eight days out of forty-five in the compulsory service of the State. For the basket of rubber they receive 1 kilog. of salt, nominally worth 1 fr. The chief receives 1 kilog. of salt for the whole. If the rubber is deficient in quality or quantity, the man is liable to be whipped and imprisoned without trial. As it is supposed to be the equivalent of the forty hours’ monthly labour, I fail to see by what right the man can be held responsible for the quality, even if he wilfully adulterates it with other substances. “The people are all disheartened, and are unanimously of the opinion that they were better off under the Arabs, whose rule was intermittent, and from whom they could run away…. “I must say that during more than nineteen years’ experience in Northern and Central Africa, I have never seen such a miserably poor lot as the Basenji in this State…. “It is perfectly clear that the Inspectors, however conscientious, hard-working, and faithful they may be, cannot remedy the excessive impositions on the natives under the present system…. “The grant of land and seed to the natives is of absolutely no use to them till they are left time to use them…. “To say that the State cannot afford the expense is absurd. The Congo is taxed unmercifully, and I do not suppose any country has less money spent upon it. The taxpayer gets literally nothing in return for the life of practical slavery he has to spend in the support of the Government. “If trade and navigation were really free, and guarded by proper police, German trade through Ujiji, which already exists to some extent, might be greatly developed, as well as that with the British colonies and Zanzibar. “The operations of the Dutch traders, who up to a few months ago had quite a considerable fleet of steamers on the Upper Congo and its affluents, and of the French at Brazzaville, and of the Portuguese, would also benefit greatly. “All these have practically disappeared from the Upper Congo. “As the result of my journey through this portion of the country, I am forced to the conclusion that the condition of the people in the A.B.I.R. territory is deplorable, and although those living in the vicinity of the mission stations are, comparatively speaking, safe from ill-treatment by the rubber agents and their armed sentries, those in other parts are subjected to the gravest abuses. “There is no free labour, the natives being forced to work at a totally inadequate wage. In visiting the various rubber-working towns, one would expect to see some signs of European commodities that had been given in exchange for the millions of pounds’ worth of rubber that has been extracted from them, but the native residents possess actually nothing at all. “Their conditions of living are deplorable, and the filth and squalor of their villages is only too apparent. The people live in a state of uncertainty as to the advent of police officers and soldiers, who invariably chase them from their abodes and destroy their huts, and for this reason it is impossible for them to better their condition of living by the construction of suitable dwellings. “No change of system to be looked for. In these despatches Vice-Consul Armstrong gives evidence of a plot against the sturdy Mr. Stannard upon the part of the infamous A.B.I.R. Company. Their idea, no doubt, was to break down his health and embitter his existence by successive law-suits. In May of 1906, the natives of a village called Lokongi rose up against his murderous sentries and burned their houses. A charge was at once made against Mr. Stannard of having instigated them to this very natural and commendable action. Natives had been suborned or terrified into giving evidence against him, and it might have gone ill with him had it not been for the prompt action of the Consul. He set off for the village, accompanied by Mr. Stannard and the A.B.I.R. director. The natives were assembled and asked to speak the truth. They said, without hesitation, that Mr. Stannard had had nothing to do with the matter, but that the representatives of the company had threatened to torture them unless they said that he had. The A.B.I.R. director held his peace before these revelations and had no explanation to offer. Consul Armstrong then pointed out to the Public Prosecutor in good, straight terms, which his official superiors might well imitate, that the matter had gone far enough, that English patience was almost exhausted, and that Mr. Stannard should be baited no longer. The case was dropped. “The work is compulsory; it is also incessant. The vines have to be sought out in the forest, cut down and disentangled from the high-growing branches, divided into lengths, and carried home. This operation has to be continually repeated, as no man can carry a larger quantity of the heavy vine lengths than will keep him occupied for two or three days. Accidents are frequent, especially among the Bakuba, who are large-built men, hunters and agriculturists by nature, and unaccustomed to tree climbing. Large as the Bakuba villages still are, the population is diminishing. Here there is no sleeping sickness to account for the decrease, there have been no epidemics of late years; exposure, overwork, and shortage of proper food alone are responsible for it. The Bakuba district was formerly one of the richest food-producing regions in the country, maize and millet being the staple crops, together with manioc and other plants. So much so was this the case that the mission at Luebo used to send there to buy maize. Under the present régime the villagers are not allowed to waste in cultivating, hunting or fishing—time which should be occupied in making rubber. So the capitas are at their old work the same as ever. The Congo idea of reforming them has always been to change their name—so by calling a burglar a policeman a great reformation is effected. Suicide is not natural with African, as it is with some Oriental races. But it has come in with the other blessings of King Leopold. The American flag presents no refuge for the persecuted. Nominally the Company makes no punitive expeditions. As a matter of fact they have engaged Lukenga, a warlike chief of the neighbourhood, to do it for them. Nominally the capitas are not supplied with guns. As a matter of fact they all carry guns, which are declared to be their personal property. At every corner one meets hypocrisy and evasion of law. “Although not wanting in physical courage or strength, they are rather an agricultural than a warlike race, and their villages were formerly noted for their well-built and artistically decorated houses and their well-cultivated fields. “It is, however, their misfortune to live in a forest country rich in rubber vines, and they have consequently come under the curse of the concessionary Company in the shape of the Kasai Trust. As a result their native industries are dying out, their houses and fields are neglected, and the population is not only decreasing, but also sinking to the dead-level of the less advanced and less capable races. “There is no doubt that the Bakuba are the most oppressed race to-day in the Kasai. Harassed by their own king in the interest of the Rubber Company, driven by the agents and their capitas, disarmed and deprived even of the most ordinary rights, they will, if nothing is done to help them, sink to the level of the vicious and degraded Bakette. “One asks oneself in vain what benefits these people have gained from the boasted civilization of the Free State. One looks in vain for any attempt to benefit them or to recompense them in any way for the enormous wealth which they are helping to pour into the Treasury of the State. Their native industries are being destroyed, their freedom has been taken from them, and their numbers are decreasing. Consul Thesiger winds up with the remark that as the Company has behaved illegally at every turn it has forfeited all claims to consideration and that there is no hope for the country so long as it exists. Straight words—but how much more forcibly do they apply to that Congo State of which these particular companies are merely an outcome. Until it is swept from the map there is no hope for the country. You cannot avoid the rank products while the putridity remains. The next document bearing upon the question is from the Rev. H. M. Whiteside, from the notorious A.B.I.R. district. I give it in full, that the reader may judge for himself how far the direct Belgian rule has altered the situation. “I should like to bring to your notice a few facts regarding the condition of this (A.B.I.R.) district. “After this extensive journey made through the district recently, and particularly the Bompona neighbourhood, I found the people working rubber in all the towns visited with the exception of those taxed in provisions. “It is difficult to know which ‘tax,’ rubber or provisions, is hardest. The rubber workers implored us to free them from rubber, and at one village upon our departure they followed us a considerable distance, and it was difficult to get away from them. The amount of rubber collected is small compared with what was formerly demanded, but I have no doubt it requires one-third of the time of the people to collect it. Many of the people of the villages behind Bompona were away collecting rubber. We met many of the Ionji people in the forest, either actually engaged in their work or hunting for a district where the vines might have escaped other collectors. We also met other villagers in the bush in quest of rubber. Almost all the village migrates to the forest—men, many women and children—when rubber is required. “In the light of these facts, how worthless are the assertions that rubber ‘tax’ has been stopped in the A.B.I.R. territory. “With regard to the provision tax, it was difficult to get any data, but it is easy for one to see the oppressed condition of the people when one comes into contact with them. Between the provision tax, porterage and paddlers, I believe that the people of Bompona have got very little time to themselves. There is one thing that one cannot help seeing, viz., the mean, miserable appearance of the people residing around the State post of Bompona. The houses or huts are in keeping with the owners of them. A very small bale of cloth could take the place of all I saw worn. In all the district I never saw a single brass rod, nor any domestic animals except a few miserable chickens. The extreme poverty of the people is most remarkable. There is no doubt as to their desire to possess European goods, but they have nothing with which to buy except rubber and ivory, which is claimed by the State. “It may be thought that I am painting their condition in too dark colours, but I feel it requires strong words to give a fair idea of the utter hopelessness and abject appearance of the people of Bompona, of the people of the villages behind the State post some twenty-five miles away, and in a lesser degree of the rubber workers opposite Bompona. “I am sorry to say there is need for agitation for the reform of the Belgian Kwango territory along this frontier. Robbing and murder are still being carried on under the rule of the Belgian official from Popocabacca. Last month he came with an armed force to the district of Mpangala Nlele, two days west of here, to decorate with the Congo medal a new chief in the stead of our old friend Nlekani. Nlekani left a number of sons, but none of them were willing to take the responsibility of the Medal Chieftainship. They, therefore, placed their villages under the authority of a powerful chief living to the north of them. “The official of the Congo Government had been insisting for a year that a younger son of the old chief should consent to be the Medal Chief. This young man, named Kingeleza, was a fine, bright fellow, but thinking that, as a younger son, he would lack the necessary authority over the people and would get into trouble with the Government if he could not satisfy its requirements, he declined. The Belgian official was, however, so insistent that Kingeleza had finally agreed in order to avoid a clash with the Government. “On his way to make the ‘investiture,’ the Belgian official robbed some villages and killed two men. Kingeleza’s people, who had gathered together to witness the investiture, hearing of the treatment meted out to the other villages, took fright and fled from their own villages, which the Belgians, upon arriving, found deserted. Whereupon the soldiers proceeded to ferret the fugitives out of the woods, where they were hiding. Twenty were seized, among whom was one of Kingeleza’s sisters, a young and attractive looking girl. Four of the villagers were subsequently released, and the balance marched off with other spoils to Popocabacca. The evangelist attached to the American mission, who was absent in the Lower Congo, had his house broken open and a tent and school materials carried off. “As for Kingeleza, some of the Belgian soldiers met him in the path and shot him. They did not know that he was Kingeleza, and Kingeleza is still being sought for by the Belgian official.